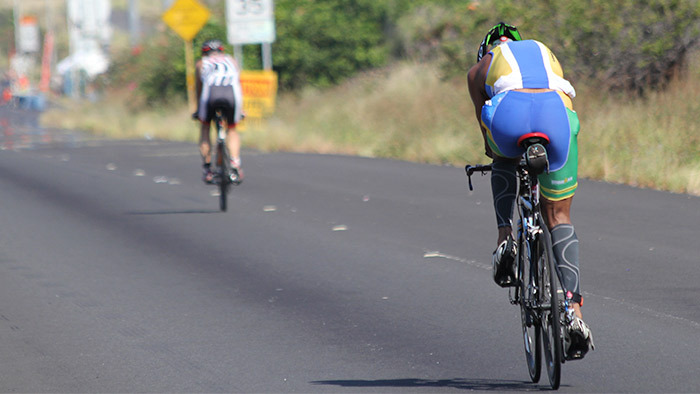 Coaching in Kona at the Hawaii IRONMAN World Championship each year is always a memorable experience. The week leading into Kona is a special one, and riding my bike up and down Ali’i Drive watching the very best athletes go through their own final preparations is a real treat. It’s an interesting perspective to think that most incredible genetic collection of humans in each gender and each age group congregate on an island in the South Pacific each October. 1. It’s getting harder and harder to qualify. With more selection events worldwide there is a greater depth of field from all corners of the world striving for the limited transition spots on the Kona Pier. It’s exciting for the growth of the sport and the depth internationally, but it does mean that you need a well refined long-term training progression if you want to earn a spot. The level of performance in the age-group ranks has steadily increased over the past 10 years. 2. The racing dynamic is different from other events. In Hawaii, the middle of the bell curve is a 10 to 10.5-hour finish versus a 12-to 14-hour finish elsewhere. The majority of the athletes have run a sub four-hour marathon off the bike in their qualifier. With a higher concentration of athletes between nine and 11 hours, pacing is more aggressive. General skill sets are higher, swimming packs are well defined and people compete for drafts. Bike handling is better and generally athletes have extra horsepower at their disposal, meaning that climbing and pace surges are higher octane. There are spectacular performances in Hawaii. Racing the best can bring out your best. There are also a lot more athletes blowing up in spectacular fashion after being subjected to the more extreme racing variables. The key takeaway here is that an event like this cannot be planned for in the same way other IRONMANS can. You need to take into account the heat, the hilly terrain and the wind into all aspects of your specificity training—and especially into your nutrition planning. 3. You need to be able to run to win. Bike for show; run for dough. In the professional ranks and throughout the age groups, the last ten kilometers of the marathon provides gross discrepancies in performance. This is a result of the complex racing dynamic mentioned above. But because there are more athletes in a tighter range, there is greater opportunity to gain or lose many spots in your category over those last 10 kilometers. Finding a way to get to the run in a competitive position with your run legs still intact is paramount to reaching podium. Training preparation for variable pace riding with surges helps, as does proper heat acclimatization. 4. Nutrition strategies are different in Hawaii than in other events. Most obviously, it’s hot and you need to drink more water. There are many other variables. Athletes are having to process very salty ocean water through their stomach early in the bike leg. Extreme gusting tradewinds equals higher heart rate spikes, and then it’s then harder to process calories. It’s also harder to reach for your water bottle. A windy bike sometimes fools you as you don’t notice your sweat rate. Escalating heat and humidity on the marathon produces a higher than average heart rate, even at a reduced pace. Again, this makes it harder to process nutrition, requiring more frequent consumption of smaller amounts. Simple carbs, liquid form calories, adjusted pacing strategy, and ease of hydration/nutrition accessibility on the bike or all keys to success in Hawaii. Learning your sweat rate in different temperatures and levels of humidity, and at different levels of intensity, allows you to adjust fluid and sodium (electrolyte) intake, and adjust caloric intake. 5. It takes a special mental mindset to have success in Hawaii. Consider that there is a high concentration of elite caliber athletes preparing on race week or race morning, coupled with the hype and excitement surrounding the week and event. This means even the most experienced age groupers can feel overwhelmed or intimidated. Learning to stay focused on your own strengths and skill set, making good tactical reads on your competitors, while keeping the self-talk positive and strong takes learning and experience. Mental rehearsals start in training in the months leading up to race day. Experience has shown that it takes a couple of tries in Hawaii to really nail down a successful day. Having an experienced coach to help you qualify and prepare you for the day can definitely expedite success on the Big Island.